FRESH DELIVERY: Volunteers with Project HOPE Food Bank, Charles Hood, left, and Gordon Hager unload a fresh shipment of canned goods at the food bank on Monday. 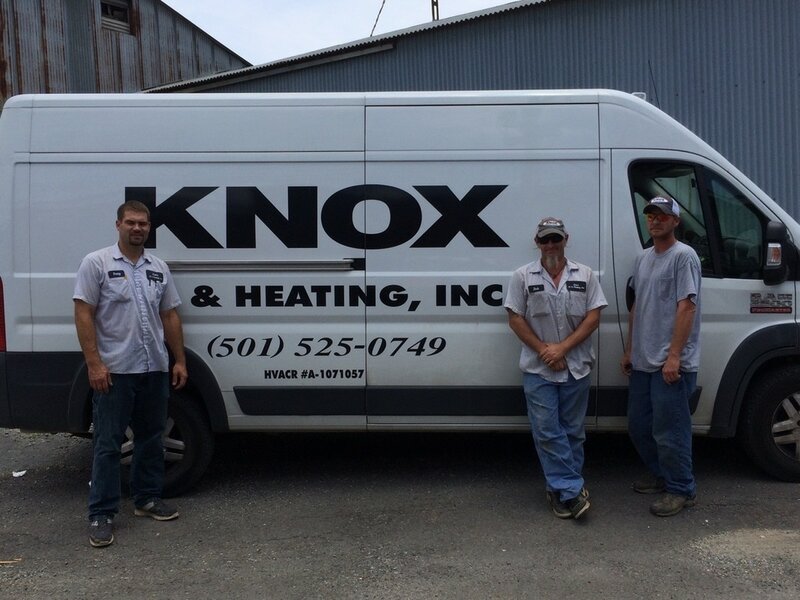 Local service organizations have extended their assistance programs to help government workers affected by the partial shutdown of the federal government. 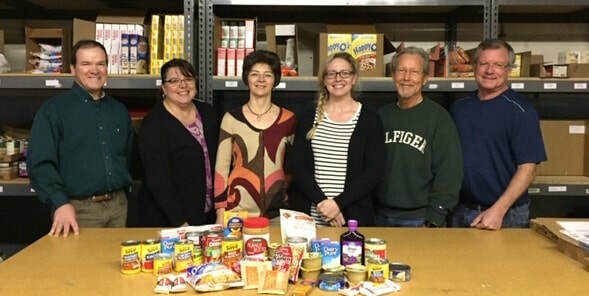 Project HOPE Food Bank announced Friday night that it would extend its assistance program to local employees who were furloughed after food bank Director Ted Thompson decided “he could not stand the fact that so many local people were going without paychecks,” Assistant Director Becky Chote said Saturday. 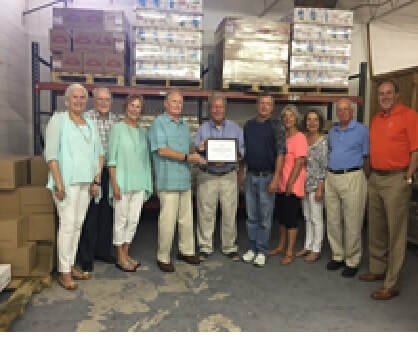 ﻿The Oaklawn Foundation presented Project HOPE Food Bank a grant in the amount of $14,762 to purchase a 4,000 pound material lift and pallet shelves. The grant will complete the food bank’s expansion project started in 2015. The funding is crucial for program efficiency and will provide the added storage to warehouse pallets of food. This is important because of the increase in food distributions over the last few years. In the first six months of 2016 alone, the food bank has distributed 460,000 pounds of food compared to the 354,000 pounds distributed during the same period in 2015. The benefits of this grant will impact the community through alleviating hunger for many years to come. Blue & You Foundation for a Healthier Arkansas provides funding for backpack program. 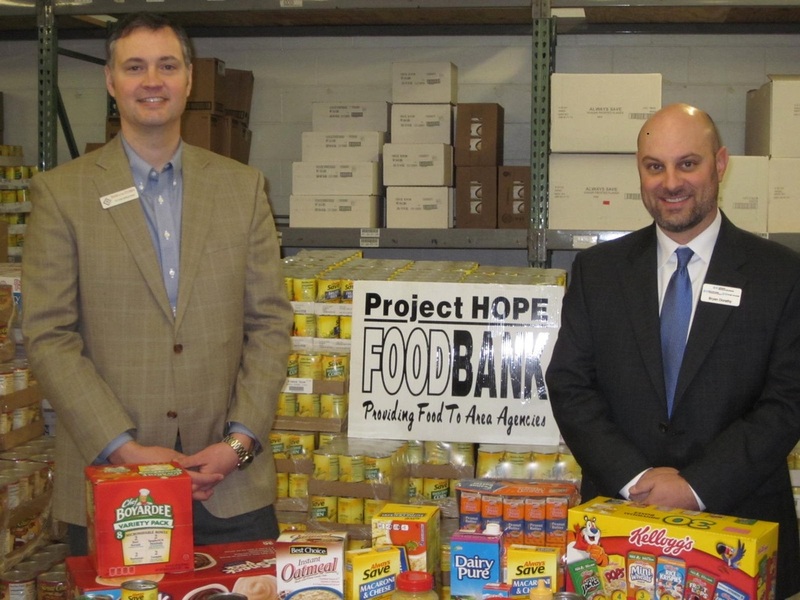 February 4, 2016 – Hot Springs, Arkansas – Bryan K. Dorathy, Arkansas’s Regional Executive for the South and South Central Arkansas, today presented a $15,000.00 check to Ted Thompson, Executive Director of Project HOPE Food Bank. The grant from the Blue & You Foundation for a Healthier Arkansas will provide food to fill back packs for children struggling with food insecurity. Pictured Left to right: Kathy Marchese, Justine Storrie, Ted Thompson, Jessyka Hanna, April Ayers, Phil Chwalinski, Shannon Vega and Eric Hanlans. 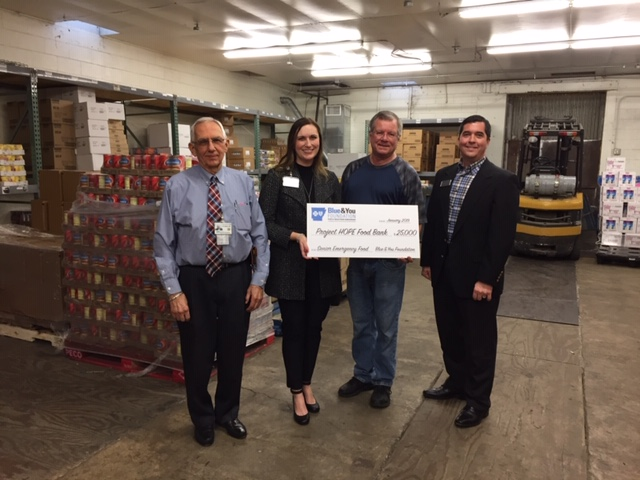 ​Project HOPE Food Bank will be able to continue its efforts to help alleviate senior food insecurity in Garland County thanks to a $25,000 grant from the Arkansas Blue & You Foundation for a Healthier Arkansas. ​Who’s hungry in Arkansas? Arkansas currently ranks highest in the nation for seniors struggling with food insecurity according to the latest report on the State of Senior Hunger in America an Annual Report from the National Foundation to End Senior Hunger. One-in-four seniors in Arkansas are faced with food insecurity. Arkansas families with children ranked among the top three in the nation by the FRAC's report on Food Hardships in America with 24.6% of our families struggling to afford enough food to feed their family. Project HOPE Food Bank receives grant from Walmart Foundation $33 thousand to provide help to seniors. ​Hot Springs, Ark., Sept. 20, 2016 – Today, Project HOPE Food Bank, Inc. received a $33,000 grant from the Walmart Foundation’s State Giving Pro gra m to assist seniors struggling with food insecurity. The program focuses on providing food to seniors to close the nutritional gaps caused by food insecurity. This grant will positively impact communities throughout west central Arkansas by providing senior emergency food boxes. The food bank partners with agencies, professional counselors, and case workers serving seniors to identify and distribute the food boxes. The agencies include area crisis centers, rural pantries, cancer centers, senior care agencies and veteran’s programs. ​May 10, 2016, Hot Springs, Arkansas – YAC held their annual grant presentation at the First United Church in Hot Springs, Arkansas. The Youth Advisory Council (YAC) is an affiliate of the Hot Springs Area Community Foundation. YAC was created in 2001 as a permanent committee of the Hot Springs Area Community Foundation. This chapter was the first in the state of Arkansas, being partially funded by the Kellogg Foundation. 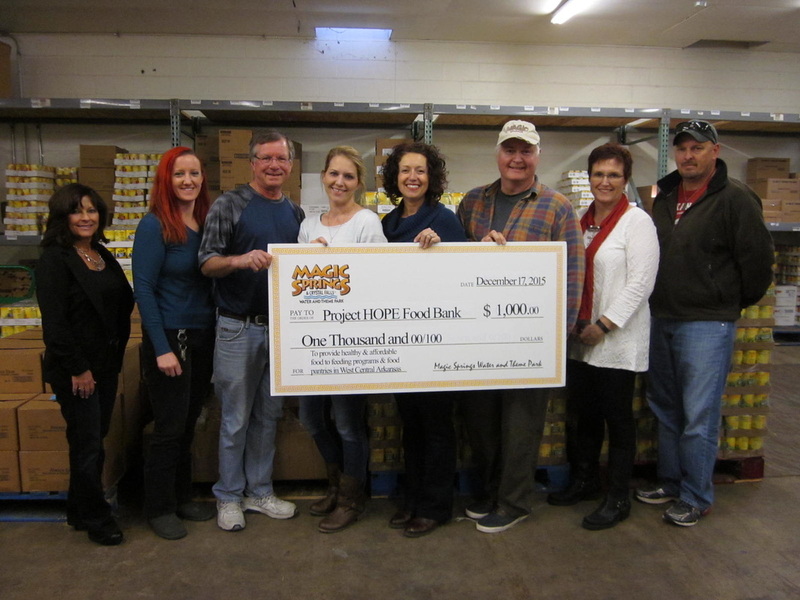 December 4, 2018 (Hot Springs, Arkansas) Weyerhauser Giving Fund has provided a grant to Project HOPE Food Bank to help local children through the School Backpack Program. The $6,000 grant will help supply food to area schools to be distributed to children when school meals are unavailable. ​Hot Springs, Arkansas – September 18, 2017 – Today, Project HOPE Food Bank received a $33,000.00 grant from the Walmart Foundation’s State Giving Program to assist with to help seniors, veterans and disabled facing hunger in our community. Specifically, this grant will positively impact the local community by providing food boxes to our less fortunate struggling with food insecurity. 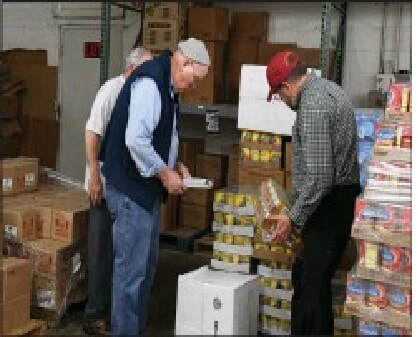 October 26, 2015 – Project HOPE Food Bank, today announced it has been selected to receive a $2,000.00 grant from the General Improvement Funds provided by the Arkansas House of Representatives, by and through the Arkansas Hunger Relief Alliance. Presenting the grant is State Representative John Vines, District 25, to Ted Thompson, Executive Director of the food bank. Representative Vines is also a member of the Arkansas Legislative Hunger Caucus. The grant will be used by the food bank to purchase food for school backpack programs.